To be fair, I have to start this review by saying that the marketing and blurbs for this one are a bit on the misleading side. It was pitched as a "riveting must-read for fall" and as the basis for the tv show Sleepy Hollow. So that appealed to me, as well as the idea that these stories form the foundation for what would become American short story writing. It turns out that even the words "other stories" are a bit off the mark. This is actually largely a collection of essays centering around Irving's travels in England. 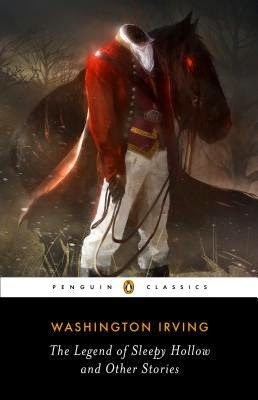 It does contain "Rip Van Winkle" and "The Legend of Sleepy Hollow" and one or two other actual stories, but it's almost exclusively travelogue and commentary on mores and literary themes in the early 1800s than it is short stories. That said, I thoroughly enjoyed the read, as you'll see in my review below. I just think that if you choose it based on the creepy cover, the comparison to the tv show, and the idea of early American short stories, you may be disappointed by what makes up the majority of the book. Obviously, Irving is considered a classic in American literature for a reason. I was very impressed with how engaging his writing was and how accessible and intriguing the stories were, given that the time during which they were written. As with any collection, there were stories and essays I enjoyed more than others, but I found them all to be remarkable time capsules describing how people lived, celebrated, and mourned in the 1800's. Again, as I realized these were mostly essays, I worried I'd become bored. I was surprised to find how perfectly apt many of his comments on society and particularly literature were for the modern day. There's a great essay where he imagines a conversation with an ancient book in an old library that I felt like I might hear on any of the book-related podcasts I listen to. And I was shocked by his essays on American Indians and their treatment by white settlers. I was amazed that people were realizing so early that they were facing serious abuses, and also saddened to see how little was changed in the way they were treated, despite essays like Irving's. While it wasn't at all what I was expecting, I was pleasantly surprised by how much I enjoyed reading this collection. Irving reminded me of an early Bill Bryson, and I think those interested in society at that time will be fascinated by this collection. That said, there are only a few actual short stories and they contain less creep than the cover and blurbs imply. I'd recommend it more to those who are interested in travelogues or the time period than I would to those looking for a thrill. Thanks to Penguin for providing me with a copy to review! I have been using this replica watch,perfect luxury watches it is a very beautiful and affordable automatic watch, good size, great quality, elegant and temperament, is my favorite style. perfect breitling luxury watches I shared this website with my friends and they were very happy.